An unexpected life-threatening allergic reaction can happen at day care facilities and schools when teachers and others are not taking appropriate action to protect the student. Research indicates that more students than ever are reporting food allergies and more school personnel are involved in food allergy management in the facility’s student population. Even so, the cases of anaphylactic (anaphylaxis) shock in school environments continue to rise. Anaphylactic shock is a potentially fatal, severe allergic reaction to the body that often happens suddenly and unexpectedly after contact with food allergens and other allergic substances. The CDC (Centers for Disease Control and Prevention) indicates there is a nearly 20 percent increase in food allergen cases among students from 1997 to 2007. Children without a history of allergies can also suffer anaphylaxis reactions. Under state and federal law, school districts in day care facilities must accommodate every student with a food allergy to minimize the potential of an allergic reaction that could cause severe injury or death. Numerous food items contain allergens including milk, fish, eggs, shellfish, peanuts, tree nuts, soy, wheat and others. In some situations, children can die in just minutes when exposed to life-threatening food allergens. Children with food allergens suffering from a disability are protected under ADA (Americans with Disabilities Act). However, in the decades since the act was enacted, protection for those who suffer from food allergies has not always been clear-cut. That is until Congress passed the ADAAA (Americans with Disabilities Act Amendments Act) in 2008, which offers well defined protection for these children and adults. Their protection extends to day care facilities and schools (both public and private) along with restaurants, recreation centers, hotels, malls, movie theaters and other locations. Childcare centers and schools cannot discriminate against any individual with a disability including food allergy sufferers, nor exclude them from programs unless it poses a direct threat to the safety and health of others. Unfortunately, not every school environment chooses to formulate 504 plans even when appropriate and necessary. As a result, many students often face serious life-threatening conditions when unexpectedly exposed to food allergens in the school environment. 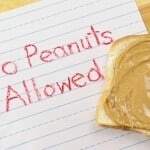 Federal cases have been filed in the U.S. District Court in Michigan and Massachusetts by parents of students who are food allergy sufferers, claiming the schools were negligent in accommodating their children’s disabilities. The suits claim the schools violated Title III of the ADA (Americans with Disability Act) of 1990. The suit alleges the schools failed to reasonably accommodate the student by modifying procedures, practices and policies to equally and fully enjoy all the advantages and privileges of its meal plan system. If you, or a loved one, have suffered an allergic reaction caused by the negligence of another in a school or day care facility, you might have a legal right to seek financial damages. In addition, if your rights have been violated by the school system unwilling to accommodate your food allergy disability, you likely have the right to seek recompense and ensure that the educational facility provides a safe environment. Rosenfeld Injury Lawyers LLC can assist you in seeking monetary damages and to hold those negligent accountable for their misconduct. Our law firm can fight aggressively on your behalf by filing a claim or lawsuit to ensure the program makes all necessary changes to secure the safety of your child. In addition, our attorneys can assist you in seeking financial compensation to cover your medical expenses, hospitalization, pain, suffering and mental anguish. Contact our law firm at (888) 424-5757 to schedule an initial, no obligation evaluation of your claim. We accept these cases on contingency to provide instant legal representation without the need of paying upfront fees.